“In nine cases out of ten, where there is a shooting, there is also a woman,” said The Times. 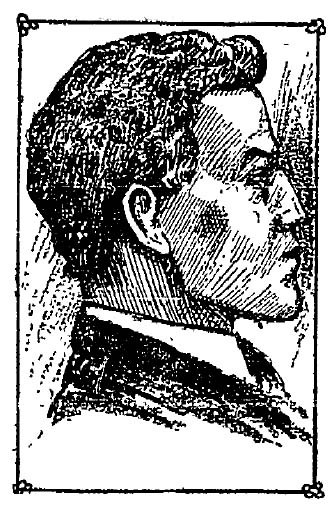 In this case, there was Oscar E. Otto, a young chauffeur with a hot temper and a gun. There was his 19-year-old wife, the former Irene E. Jester, “a silly little creature with futile tears and French heels.” And there was J.C. Henderson, another chauffeur with a gun and better aim or more luck. Untangling the story of this fatal triangle—at least it was a triangle in the mind of Mr. Otto if no one else—is difficult, in part because of the charges and countercharges and partly because the presses weren’t properly inked and much of the text is faint. But a few things seem clear: In May, about the time of the Ottos’ first anniversary, Henderson was hired to take a man and two women from the Saxonia apartments to Fred Ward’s roadhouse on Mission Road, otherwise known as the East Side Athletic Club. “Both women were introduced to him as single women and it was not until their return to the city, when one of the women refused to ride down Pico Street, that Henderson suspected she was married,” The Times said. The next day, Henderson said, he received a phone call from Mrs. Otto, asking to meet him on Main Street. He said he barely recognized her because her face was swollen from a vicious beating. She asked him for $10 ($205.24 USD 2005), explaining that after her husband beat her, he ripped up her clothes and threw her out of the house. Sometime later, she barged into Henderson’s hotel room and darted into a closet, claiming that her husband was out to kill her. Mr. Otto, although he was a smaller man, followed and beat Henderson viciously. Of course, Mr. Otto had a different story. He sued Henderson for alienation of affection in August, charging that his wife and Henderson had gone for many long drives, and visited resorts and cafes, where his wife “drank intoxicating liquors to excess,” The Times said. Since then, witnesses at the murder trial said, Otto had talked constantly of revenge. 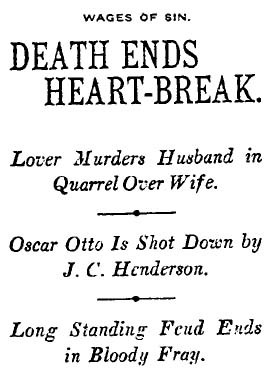 On the night of the killing, a friend said, the two of them had gone for a drive to East 9th Street and Tennessee, where Otto said he had an appointment with a man. Henderson testified that he had been driving down Broadway when Otto jumped on the running board and threatened to kill him before jumping off at 9th Street. Henderson said he took his car to the garage on Tennessee Street and spent about 15 minutes putting it away when Otto arrived. As Otto jumped out of his car, Henderson said, he saw a flash of light and was sure that Otto had fired at him. He was afraid to run because Otto might shoot him in the back, so Henderson stood with his hand on the pistol in his pocket until Otto got close. “He called out as he came near and as I kept backing away, ‘Pull it out, you _______. That’s just what I want. Pull it out,’ ” Henderson said. The jury in Henderson’s murder trial returned a verdict in two minutes: Not guilty. And in an intriguing but unexplained footnote to the story, shortly before he died, Otto asked to see Miss Jossie Golman. She said he was nothing to her but a friend and refused to go. This entry was posted in 1907, Homicide, LAPD and tagged #guns, 1907, domestic violence, homicide, tragic affairs. Bookmark the permalink.